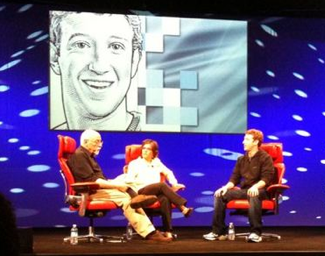 Today during an interview at AllThingsD’s D8 conference, Facebook CEO Mark Zuckerberg got grilled by Walt Mossberg and Kara Swisher on Facebook’s recent privacy changes, the resulting backlash, and the company’s long-term vision. By far the most tweeted about moment of the conversation came around a third of the way through, when Zuckerberg (who was sweating and appeared to be nervous, according to multiple tweets) took off his famous hoodie, revealing it to have Facebook’s mission statement stitched inside. Fortunately the conversation didn’t linger on Zuckerberg’s attire for long — the questions quickly turned toward some more pressing issues like Instant Personalization, and how Zuckerberg goes about making decisions. When asked about the site’s privacy changes, Zuckerberg wasn’t exactly forthcoming. Many tweets, and the official live coverage of the event, noted that Zuckerberg dodged some questions about privacy, resorting to talk about encouraging serendipity through openness and well-worn anecdotes detailing why sharing is important. Zuckerberg also brought up Facebook’s oft-repeated stat that over 50% of users have adjusted their privacy settings, citing it as evidence that users know what they’re doing (this doesn’t convince me in the slightest — that means nearly 250 million people haven’t touched them). With regard to Instant Personalization, Zuckerberg referred back to the News Feed backlash as evidence that innovative features can become immensely successful once the controversy dies down. He predicted that a few years from now, we’ll look back and question why all of these websites weren’t personalized. Asked about leadership and his role at the company, Zuckerberg said that he would remain as CEO after an IPO, though he didn’t know when that would be. He also said that he regularly consults with a “core group” of Facebook employees that he has worked with for years, and that any of them would be capable of steering the company. Toward the end of the conversation, Zuckerberg also noted just how much Facebook manages to accomplish with extremely small teams. Facebook Chat is run by one person. And Facebook search — which Zuckerberg said sees usage that’s on the same order of magnitude as Google search — is run by only twelve people.